Gaff topsails, genoas, jibs, staysails, spinnakers, mainsails, mizzens… you name it, any size, any shape and kind of sail could be seen on the bay of la Napoule today, for Day 4 of the Régates Royales. Classic yachts, small and big, one-designs and metre classes profited from ideal conditions on yet another sunny and windy day. A happy ending for the Russian Dragons, with Annapurna skippered by Anatoly Loginov, a veteran of the French event, to clinch the win on the last day. Tomorrow last and decisive day. 200 boats, 12 classes, two race courses: the racing management of the Régates Royales is not small thing. Yet, on the bay of la Napoule and in the Golfe Juan, the racing went underway as if set by a metronome. 15 metre I.R. Mariskashocked all her competitors with a port start, a master stroke by tactician Christian Ponthieu and helmsman Sébastien Audigane. Unfortunately it was not enough to keep Moonbeam of Fife and Moonbeam IV at bay, and Mariska lies in second between the two Fife’s designs. Among the gaff cutters Kismet and Kelpie swapped places from yesterday and are now tied at the top at 3 points with a comfortable advance on French Viola- this year celebrating her 110th birthday- that today only scored a fifth. 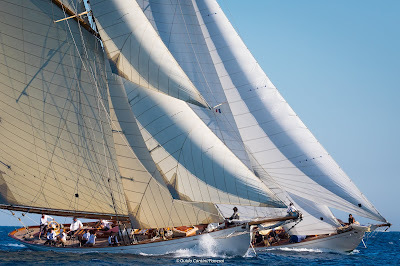 In the Classic division the top two places are both occupied by Spanish-flagged boats, Argos and Yanira respectively, leading on France’s Arcadia while among the Classic Racers the local crew of Sagittarius lead on Italy’s Resolute Salmon and Il Moro di Venezia. In the big Marconi division, Argentina’s Cippino scored the second consecutive win and has a margin of two points on USA’s Santana and six on Blitzen. The schooner Mariette sits on top, advancing Elena of London and Naema. Finally, in the Spirit of Tradition class, star studded crew of Vanessa, with helmsman Torben Grael head on Freyaand Scherzo. The BOD’s provisional podium is all British, with Six Stuart’s Guillemot in first, Tim Barrett’s Kite in second and Philip Harston’s Puffin in third. Last chance tomorrow for the fleet to fight for the title in the 40th edition of the Régates Royales and to conquer the Panerai Trophy 2018. Start is scheduled for 11:00 am. It's Marigold’s age, the oldest boat in the fleet of the 40th Régates Royales. Easily recognisable by her dead straight bow and very raked stern, this gaff cutter was designed by charles Nicholson and built by the Camper & Nicholson Shipyard in 1892. Despite a careful restoration, in the fist decade of the 21st century, Marigold is still faithful to her original spirit and has no electrical winches or equipment. A jewel from the 19th century that still sail and race to the day.